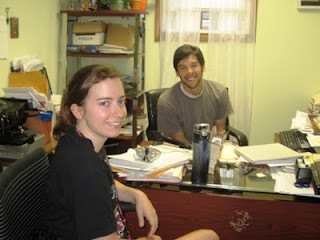 My fellow Franciscan Outreach Volunteers and I have been at Franciscan Outreach for about 7 months now, which is just over the halfway mark on our yearlong commitment. There is much to reflect on and it's fascinating to see the ways in which the organization has changed, how the friendships within our community have deepened, and how we have all adapted to our work environments and grown in the way in which we care for our guests. 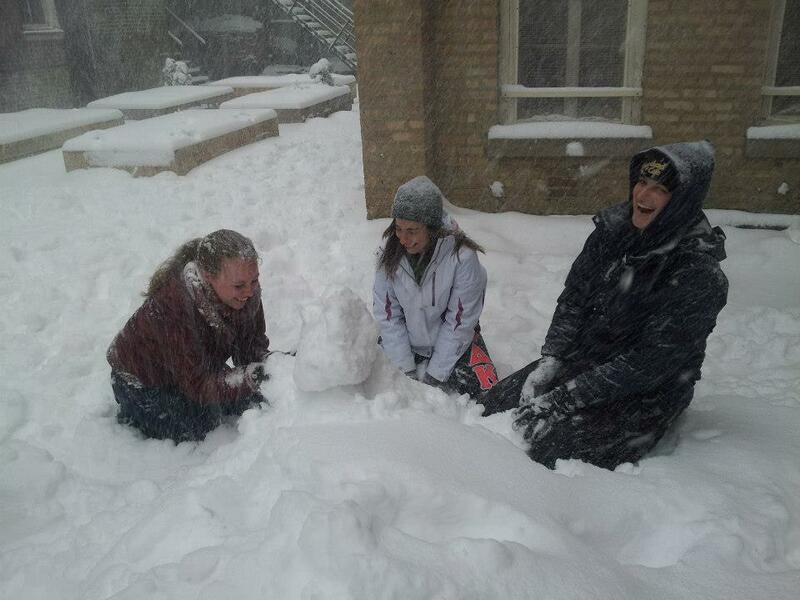 Carissa, Emily and Molly trying to build a snowman. There are several amusing anecdotes I could give you about the antics that go on around the house with all the volunteers or I could tell you a story or two about what the women I've come to know while working at the Franciscan House homeless shelter and the things they have struggled with. But what has really been on my mind recently and what I have spent time talking about with members of my community, is how many of us are struggling with staying positive. Now I'm not going to just start complaining about feeling tired, frustrated, and a little burnt out, but I think it's important to be honest and point out that this is a challenge that most full-time volunteers have to face and more importantly, overcome. I realize in the grand scheme of things 7 months is no time at all, but when you're working 40-hour weeks at a soup kitchen or overnight at a homeless shelter with people who suffer from drug addiction and mental illness, have survived jail or unspeakable traumas, and have spent years fighting to make it through one more winter with what they can scrape by, it can feel like a lifetime. Fortunately we are at the point where we know our guests pretty well and are adept at carrying out the responsibilities of our jobs (though there is always room for growth). I've found that lately though, that I've been getting frustrated with our guests more easily and at times I feel more cynical than compassionate. I also believe the fact that we are still smack dab in the middle of winter (Chicago winter no less) adds to the struggle. I personally have never liked winter and I am from Texas where it lasts about a week. Many of us have also been dealing with the loss of family members or breakups or have started worrying about where we'll be after this year. While I think our problems often pale in comparison to what our guests are going through, it still adds to the stress of learning to serve others in an environment where you often cannot predict what kind of interactions you will have with people that day. While there are many things that we cannot change or fix and may continue to frustrate us, we need to continually go back to the reasons for joining this program. We didn't choose a year of service with a Franciscan program simply because we wanted to have fun exploring Chicago. We chose this to learn how to be more selfless in giving our time and our energy in service to those in need, to further understand the injustice of homelessness, and to better see Christ in other people and within ourselves. Hopefully we will also find time to rest and be renewed as we continue to seek each others support and love. As an intentional community we try to be purposeful in asking each other how work and life in general is going and be there to just listen or sometimes join in venting about our frustrations. I cannot stress enough how valuable it is to live with other people who also participate in and truly understand the work I do and the situations I face each day. In addition, besides our weekly reflections we've also been having community prayer/reflection time early in the morning each day of Lent, which has given us opportunities to read God's Word and find the strength to show mercy and love when we are running low on patience. I look forward to the next 5 months of our volunteer year, which are sure to surprise us with new experiences, friendships, and a sense of accomplishment.